Large 4 bedroom villa with spacious garden and pool area, located in central Protaras. This spacious villa is ideally located close to the resort centre of Protaras. Inside, the villa features an open plan living dining and kitchen area. The living area has satellite television, dvd player and home cinema system. The kitchen is fully equipped with everything you require for a comfortable self-catering stay. There is also a ground floor W.C. and a dining area for 8 people. On the first floor there there are two double bedrooms and two twin bedroom with two single beds. There is a large family bathroom with bath and a seperate shower room also. Situated by the sea and a short 10 minute walk from the Protaras Strip this villa is perfect for families and friends who want to be within walking distance to the fantastic beaches and restaurants Protaras has to offer without staying right in the hustle and bustle. The sea is only a 2 minute walk away! There are a further 2 villas available for rent on the same complex, making it an ideal choice for families or groups who wish to stay close to each other. Protaras has sandy beaches with clear sky-blue waters and the most well known beach in the area is Fig Tree Bay. 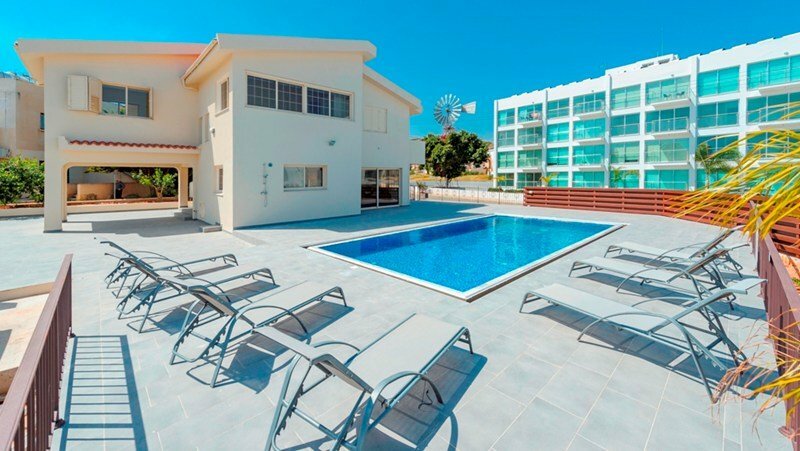 On the back of the success of Ayia Napa (which is only a few km away), it has expanded into a modern holiday resort of considerable size with tens of high capacity hotels, hotel apartments, villas, restaurants, pubs and associated facilities. A lovely villa for those wanting to be close to the resort centre and all it has to offer !